EUserv has expanded its servers to a new server series with 3 models. The „Instant64“ server series provides a combination of fast processors, lots of RAM and fast SSD’s respectively large hard drives in the 4th generation at a great price/performance ratio. The server in this series are ideal for web projects, starting with simple blog creations up to a medium-sized single-host web application or website. Even smaller virtualization projects can thus be easily implemented. The current FreeBSD 9.3 is now available for dedicated servers and can be installed via the EUserv customer panel. FreeBSD 9.3 is provided with updates for a total of two years. As in the previous version, further improvements have been implemented for ZFS. Thus, for example, snapshots can be managed more efficiently by using „bookmarks“. In addition, ext4 file systems can now be accessed by reading. On the hardware side, particular improvements in the network drivers for Intel and Realtek can be mentioned. Among the available software updates, BIND (9.9.5), OpenSSH (6.6p1) and OpenSSL (0.9.8za) are included. In addition, the Xen integration was continued. The random generators from Intel and VIA are no longer part of the release. For now, the use of „Yarrow“ or „Fortuna“ is recommended. Because of the great demand, we extend our Black Friday Steal Deal until the end of the year. 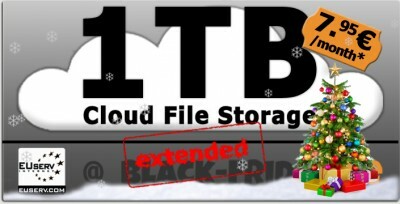 For all new and existing customers we offer the 1.000 GB online storage „Backup HD 1000“ for only 7.95 EUR/month instead of the regular price of 18.95 EUR/month. Save your data, pictures or music secure and have them always available. The access to the online storage is encrypted by using Rsync, Web, or WebDAV. You can create as many data uploads and downloads. Traffic restrictions do not exist. On Friday, 19th of December 2014 our phone support is not available from 12 p.m. until 5 p.m. because of an internal training. Support requests will be handled via the support system in our customer panel. Customers with optional booked support SLAs are not affected by the limited phone support. Ab sofort gibt es das neue Servermodell „Prime64 HR1 v5“. Das Modell ist weitgehend identisch mit dem Server „Prime64 M32 v5“, verfügt jedoch zusätzlich über einen 3ware Hardware-Raid Controller mit 128MB Cache und vorkonfigurierten Hardware-Raid1. Der Server eignet sich sehr gut für Virtualisierungs-Projekte oder Hostingumgebungen z.B. für Webagenturen oder Firmenkunden bei denen Wert auf echtes Hardware-Raid gelegt wird. Rahmen der Einführung des Servers die Setupgebühr komplett erlassen. A preconfigured installation of CentOS 6 with cPanel is now available for all dedicated servers. cPanel is one of the leading server configuration- and administration tools in the market. Its extensive configuration and customization options make it especially suitable for resellers. The user has access to 2 different interfaces, WebHost Manager and the cPanel interface. With WebHost Manager (WHM) the user has access to complex server management tools. This includes user and customer management, DNS and FTP configuration as well as many security settings. Resellers can manage their own customers and plans. Extensive branding options provide the ability to customize the looks of the panel. For customers cPanel provides all necessary tools needed to administrate websites. It provides interfaces for management of Email addresses, FTP accounts, databases, security settings and many more features. The installation of cPanel and WHM based on CentOS 6 can be performed via our customer panel. For servers with multiple hdds a version with software raid 1 is available. Note: The installation comes with a 15 day trial license. A license key is needed for the operation of cPanel and WHM after the trial period. Licenses can be purchased online directly from cpanel under https://store.cpanel.net/.